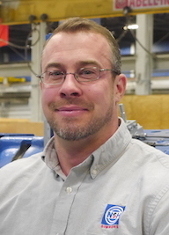 Simmons Machine Tool Corporation has promoted Brandon Teal to product manager wheel truing/re-profiling. Teal will continue to lead sales efforts for the Simmons wheel and Hegenscheidt re-profiling product lines. He will also be involved with coordinating product specifications with engineering, sales, and marketing, as well as developing strategies for the introduction of the Stanray M-Series. Teal joined the company 13 years ago as a service technician, where he installed and commissioned underfloor wheel lathes and other Hegenscheidt and Simmons products. He later served as machine sales associate and sales engineer. Teal is a member of the Locomotive Maintenance Officers Association’s (LMOA) Facilities, Material, and Support Committee.